Photographs are often used to tell a story. Good examples of this may be found in some of the photographs sent by emigrants to their kin back home in the old country. They wanted not only to be remembered by and keep in touch with their families, but also to share their new lives with their parents, siblings, cousins etc. Perhaps they were even trying to convince them of the good life, and persuade them to join them in their adventure. Kimberly Carlton sent me this photo by Seaman & Sons of Chesterfield and asked: "I purchased this photo at a garage sale in the Kansas City, Missouri area, so I don't know the subjects. The back has some faint pencil writing that I think says "Frank Wood". It looks to be around the turn of the century, but not sure. Did this photographer ever work in the USA or is this pic from the UK? And why wouldn't these people be standing next to each other, I thought that was strange how spread out they were?" I believe, by comparing the style of the mount with others produced by this studio, that the photograph was produced at around the turn of the century, as Kim has suggested. The shape of the house looks to me to be more suited to North America than late Victorian Derbyshire. 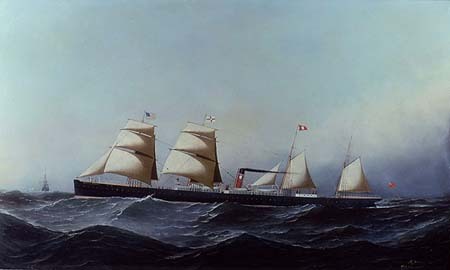 I have no evidence that any members of the extensive Seaman family spent any time in North America, and have seen no other examples of photographs taken by them outside England. I wonder if perhaps the photograph was originally taken somewhere in North America, sent to relatives back home in Derbyshire, and subsequently copied by Seaman & Sons? From the shape of the sleeves of the dresses worn by the women, I think it likely that the photograph was originally taken in the 1890s. The more I think about it, the less I can imagine this building being in Derbyshire, England, and the more convinced I am that it is located somewhere in North America, perhaps not far from Kansas City, Missouri where Kim rescued it from a garage sale. The style of photo, with the people spread out like that, although not as common as more formal studio portraits, could, I believe, have been intended by the photographer to give more of an impression of the lifestyle of the recently arrived immigrant family to their kinfolk back home in England. Although the subjects are nominally the four people, in the usual stiff, unsmiling poses common to both indoor studio portraits and outdoor poses of the era, the photographic artist, as he would no doubt have styled himself, is trying to convey a much "bigger picture". The saw and horse, pile of freshly sawn logs, wagon or cart pulled by pair of large horses harnessed to a wagon, waiting in the yard, the rough wooden fences in the background, perhaps enclosing the yard or an orchard, and last but not least the large, solid, two-storey house, are perhaps employed to tell a story to their relatives at home - one of hard work and just reward for their efforts, and a picture of their new life in a new land. Judging by the lack of leaves on the trees I guess this is late autumn or winter. Is that a smudge towards the top of the photo, or perhaps smoke coming out of the chimney? A fire in the hearth would not be out of place at that time of the year. I note that there are no young children shown in the photo. The man with a beard, wearing strong shoes, a wide-brimmed hat and long coat, marked above and below with two Xs, is obviously the primary subject, and presumably man of the house. 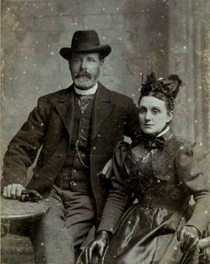 The woman with a long dress standing behind him, and slightly to his right, is probably his wife The female at the extreme left appears to be a young woman - her dress is shorter, which suggests to me that she is perhaps in her teens. Perhaps she is a daughter. The younger man with a smaller hat and shorter jacket, holding the reins may be part of the family, but he could well be an employee on the farm. 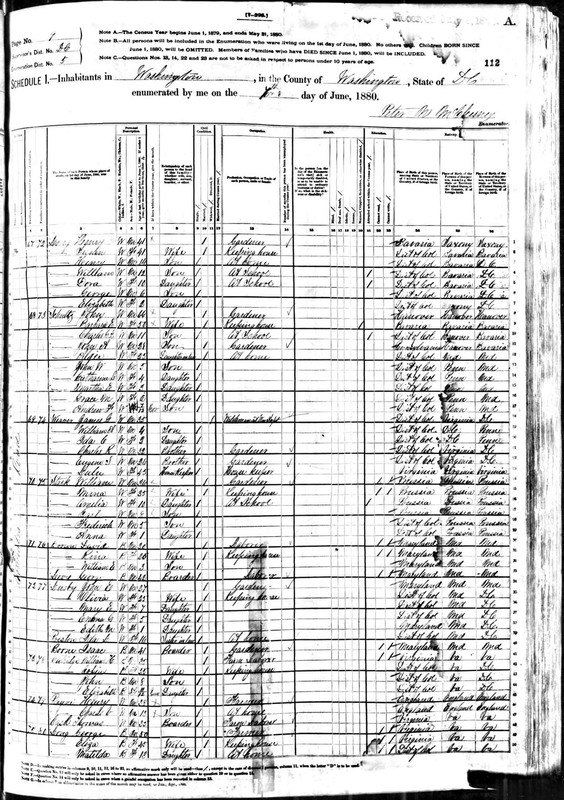 This brings to mind the story of my own gg-grandfather, Henry Payne (1842-1907), who took his wife Henrietta and children to start a new life in America in 1880. 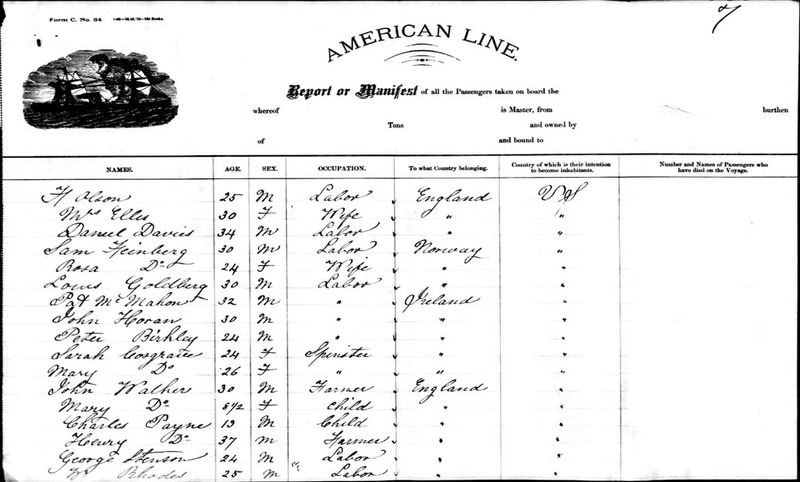 First Henry and his 13-year-old eldest son Charles Vincent (my great-grandfather) sailed from Liverpool to Philadelphia on board the S.S. British Crown, arriving on American soil on 2 March [see my transcript of the Passenger List]. 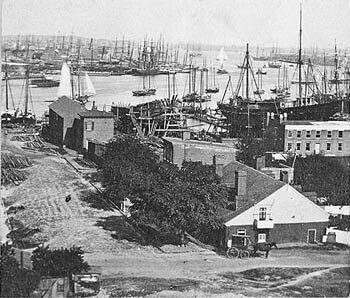 According to my gg-uncle Hallam, they "took up" a farm at Bladensburg, about four miles north-west of Washington D.C. 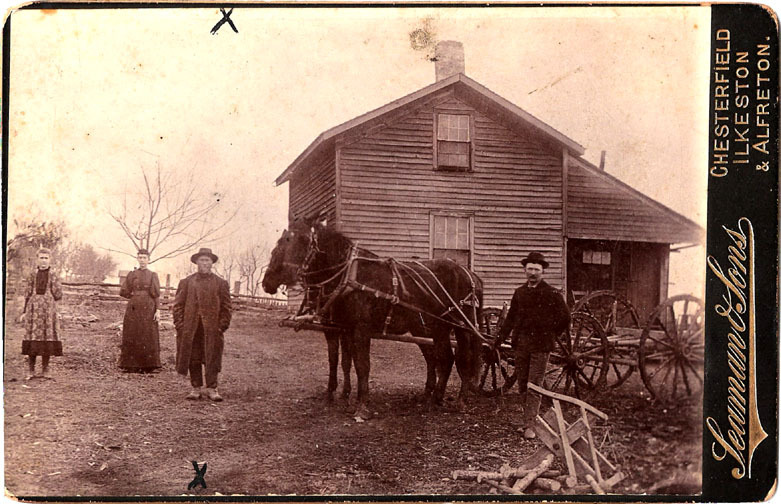 They must have moved fast to find the farm and get the crops planted by late April or early May, although the census on 7 June shows a farm labourer Thomas Cash boarding with them, and he may well have helped, driving the wagon just as the man in Kim's photo. 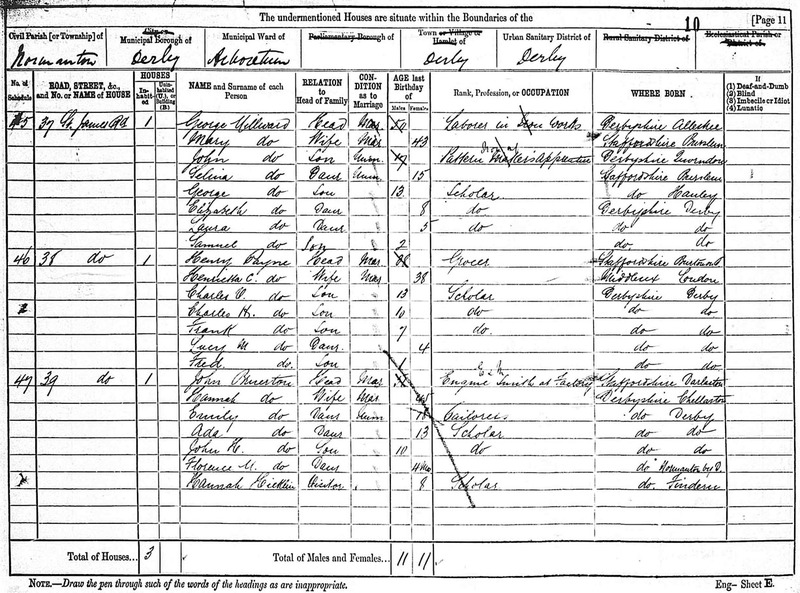 1880 Census entry for Henry & Charles V. Payne at Columbia Road (Bladensburg), Washington D.C.
Henrietta had given birth to their fourth son Fred at St. James' Road in Normanton (Derbyshire, England) in December the previous year, and probably waited in Derby for Fred to get a little older, and for word from Henry, before setting out to join them. 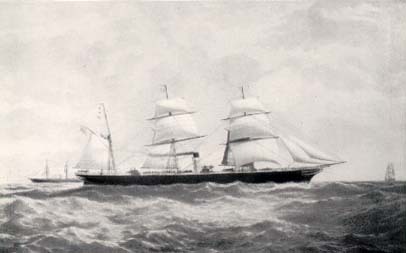 They left Liverpool in late June, they arrived at the Port of Baltimore - via Norfolk and Halifax - on 7 July aboard the SS Hibernian [see my transcript of the Passenger List], and must have joined Henry and Charlie at the farm shortly after. Even after the rigours of an Atlantic crossing, they do not seem to have had much time for rest and recuperation. Only two days after their arrival, Hallam fell out of "the buggy" and broke his right arm, resulting in a "four or five week stay in hospital in Washington." In the meantime, Charlie was attacked by two "niggers" (Hallam's words, not mine) on his way back from Washington. Of far greater importance, however, was the fact that the climate did not agree with Henrietta's health. 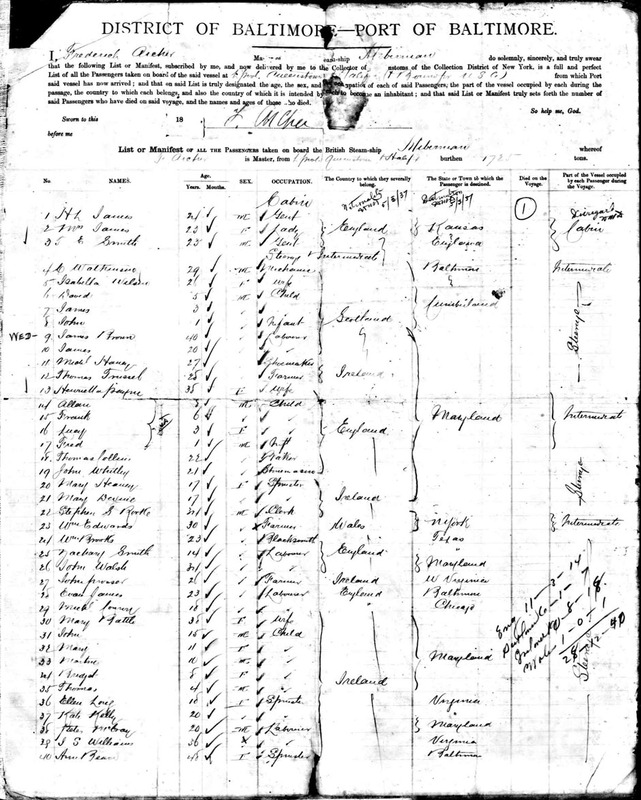 They returned to England soon after Hallam's recovery, "leaving all the crops in the fields", and the UK census shows them again running the family grocery at 38 St. James' Road in Normanton by 3 April 1881. The trip seems to have been a disaster, and Henry apparently gave up any ideas of leaving England again. It did not, however, put off their children. Hallam, Charles Vincent and Frank, together with CV's young bride Amy, made short-lived forays to Chicago in the early 1890s [1890-1892: Chicago, Pullman & the World's Fair]. My grandfather Leslie Payne was born during this stay in Chicago, and himself returned to North America when he was a young man, spending a few years before and after the First World War in Saskatchewan and Manitoba.